Brandy, cream cheese, cinnamon and lemon peel combine to make this sweet and spicy cake. Substitute rum or lemon juice if you wish. Line 13x9-inch pan with parchment, with ends of parchment extending over sides; spray with cooking spray. Beat cream cheese and butter in large bowl with mixer until blended. Add 2-1/2 cups sugar; beat until light and fluffy. Blend in vanilla. Add eggs, 1 at a time, beating well after each addition. Gradually beat in flour until blended; spread into prepared pan. Meanwhile, bring water, remaining sugar, cinnamon stick and lemon peel to boil in saucepan; simmer on medium-low heat 10 min. or until reduced to 1 cup. Pour through strainer into measuring cup. Discard strained solids. Stir brandy into strained liquid. 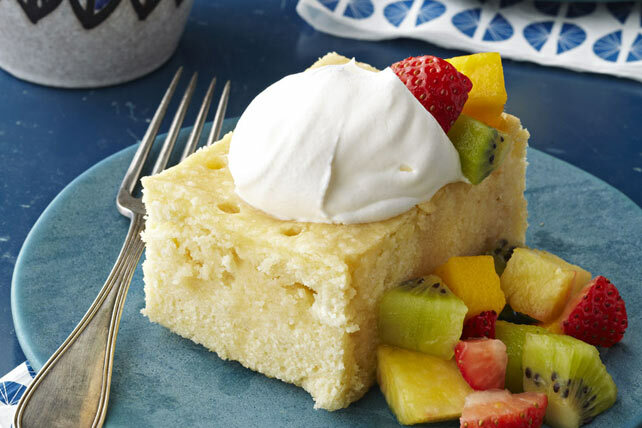 Use skewer to poke holes in warm cake at 1/2-inch intervals. Drizzle brandy mixture over cake. Let stand (in pan) 1 hour. Use parchment handles to remove cake from pan. Serve topped with Cool Whip and fruit. You'll know it's a special occasion when you get to enjoy a serving of this delicious cake. Substitute rum or 1/4 cup lemon juice (squeezed from the peeled lemon) for the brandy. Wash the lemon. Starting at one end of lemon, use vegetable peeler to remove lengthwise strips of peel, being careful to not peel through to bitter white membrane under peel. Wrap the peeled lemon tightly and reserve for another use.